The trouble with satellite radio is you can't carry it around with you - the dish sees to that. However, the Sky Gnome allows the next best thing. 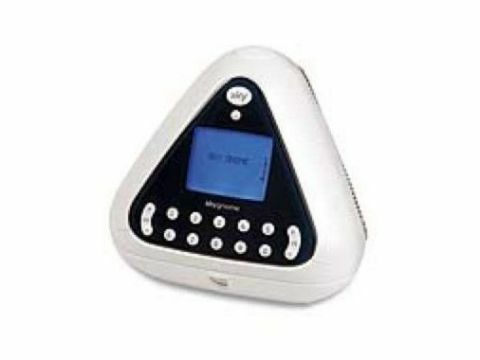 While the satellite receiver stays in one place, the Gnome system transmits the audio, in stereo, to a portable radio player. Both the base station (which connects to the Digibox) and the Gnome receiver are plastic triangular pyramid boxes. The Gnome has two 3-inch speakers in its rear faces and on the (blue or orange) front panel a backlit LCD and buttons for 0-9, volume, channel, Sky and Power. There's also a headphone socket and line out sockets. It uses the same frequencies as a video sender to play the audio from whatever channel the Digibox is tuned to, through the Gnome speakers. The display relays the TV info banner information from the Digibox (channel number and name and current programme and time/ date are displayed) and there's also a return path to change the channel. This is selected using the channel up/down buttons, or the required number entered with the number buttons. You can even store favourite channels on the Gnome to be called up with one (long) press of the number buttons. The Gnome will relay audio over about 30m. Its amplifier is only 1W per channel but the quality is remarkably good, with reasonable bass and little distortion. It's as good as most portable radios, and in stereo. There's a volume control (with a scale on the LCD) but no control over the tone or balance. It would be nice to be able to control Sky playback with the Gnome, or to use the Sky Planner to turn the Gnome into an alarm clock radio but as it stands this is an excellent Sky accessory - and for satellite radio fans a real liberator.